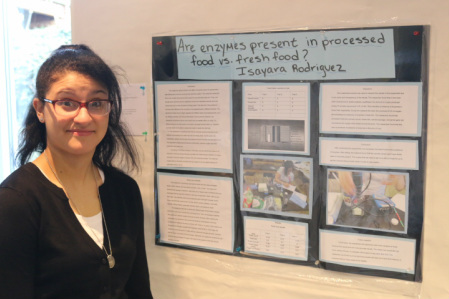 It is possible to download photos by right clicking and selecting "save link as"
Our third place winner was Isayara from Menwith Hill with her research entitled Do Enzymes Stay as Active in Processed Food vs. Fresh Food? He won the following for his achievements at the Regional level; a $100.00 Regional cash award. 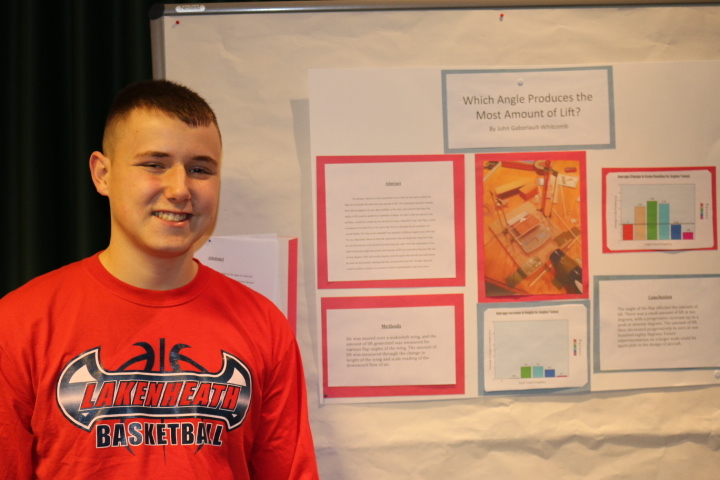 Our fourth place winner was Seanwolfgang from Ramstein HS with his research entitled A Proposed Method of Testing for Chloride Samples and Its Results. He won the following for his achievements at the Regional level; a $50.00 Regional cash award. This experiment tested whether males are stronger than females. The researcher used the hand grip Vernier equipment to test her subjects. The subjects would squeeze the Vernier equipment for 30 seconds and the researcher would find the mean of their strength. The researcher used 26 participants during this study, 13 were males and 13 were females. All the participants were high school students from the same school. The researcher’s hypothesis was that males would be stronger than females. The independent variable of the researcher’s project was the gender of the subjects, and the dependent variable was the subject’s strengths. The average or mean for males was 178.9 Newton. The standard deviation was 61.6. The Average or mean for females were 125.5Newtons. The standard deviation for females was 40.9. Having low number for the standard deviation in both females and males reflect how close the results were to the averages. The T-test was used in this study to see if the differences in the average for each group were significant. The T-test score was 0.01, which shows the averages were not significantly different. Based on the results that the researcher gathered, the males were in fact stronger than the females. The T-test number was lower than 0.05, there was a significant difference in the gender’s averages. The primary objective of the experiment was to find out the angle at which the flaps of an aircraft will attain the most amount of lift. The experiment was done because there did not appear to be any data available on the topic, and concrete data about the angles of lift could be useful for a multitude of things. In order to find the answer to the problem, a relatively simple rig was set up involving a makeshift wing (with flaps), a scale to measure the downward flow of air, and a hair dryer (to simulate the air resistance of a normal flight). The flap on the makeshift was a adjusted to different angles every fifth trial. The tow data points observed from the experiment were the height the wing rose in the air, and the amount of air forced downward using the scale. From the experiment, it was observed that the angle that got the most amount of lift was somewhere between fifty and seventy degrees. Fifty and seventy degrees were the angles that rose the most and forced the most air downwards, meaning that they produced the most lift. The data observed could be useful in aviation, toy products, further experimentation, and much more. This experiment looks at the refraction of light in not only American sodas but British sodas as a well. This experiment determines whether American sodas have large indices of refraction than British sodas and also what determines the angle and amount of refraction of light through the sodas. After completing this project, it was shown that American sodas did have a larger index of refraction, but only just barely. It also determined that high fructose corn syrup played a role in determining the number of times light was able to refract and the angle of refraction; the greater the amount of sugar, the larger the angle of refraction. In doing this experiment, it was found that some sodas didn’t let light pass straight through them, but instead had it bounce off in different directions. Expanding the experiment, Sprite, the soda with the lowest density, was mixed with the other and aided in the refraction of light in multiple directions. In conclusion, this experiment showed that dimethylpolysiloxane and corn syrup aid in the number of times a laser can refract and corn syrup, sugar, potassium, aspartame, and sweeteners aid in both the angle and index of refraction numbers. A pendulum is an object connected to a fixed support in such a way that it is free to swing back and forth under the influence of gravity. The Period of a pendulum is the time it takes for the pendulum to complete one swing. However different factors can alter the period of a pendulum. 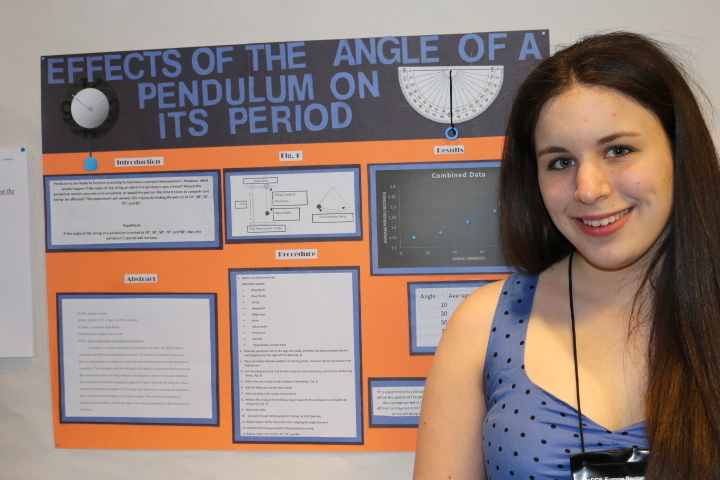 The experiment tested how the angle of the string on a pendulum affected its period. The experiment needed to be tested because of an inconclusive result in a previous experiment. The experiment was tested by changing the angle by 30 degree intervals and timing how long it took for the pendulum to complete 10 full swings. The experiment revealed that the pendulum’s period will increase as the degree of the string increases. This means that the period of a pendulum is easily altered, and that the angle of the string can dramatically affect the period of a pendulum. The researcher wanted to look deeper into the physics of the game called Bowling. The researcher wanted to focus on the bowling balls’ control, and their contribution of hitting the pins. The main goal of bowling is to receive the most pins in the least amount of attempts. 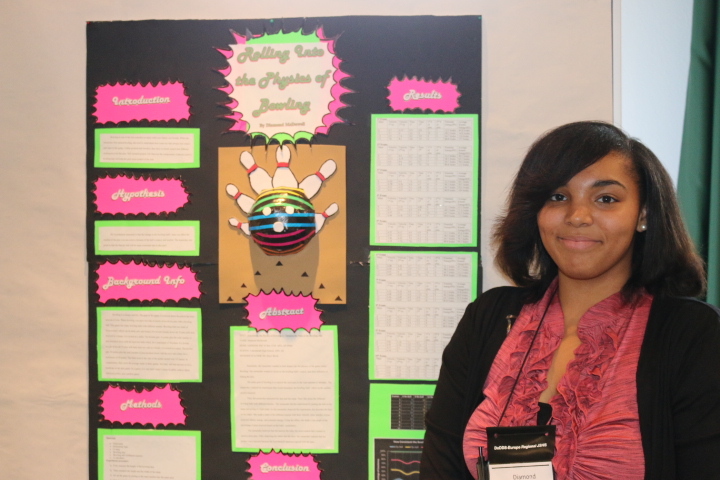 The researcher designed an experiment that would determine the bowling balls’ effect on the number of pins received. First, the researcher measured the lane and the ramp and then chose the different bowling balls with different masses. The researcher did the experiment by putting the ball on the ramp and giving it a light push. 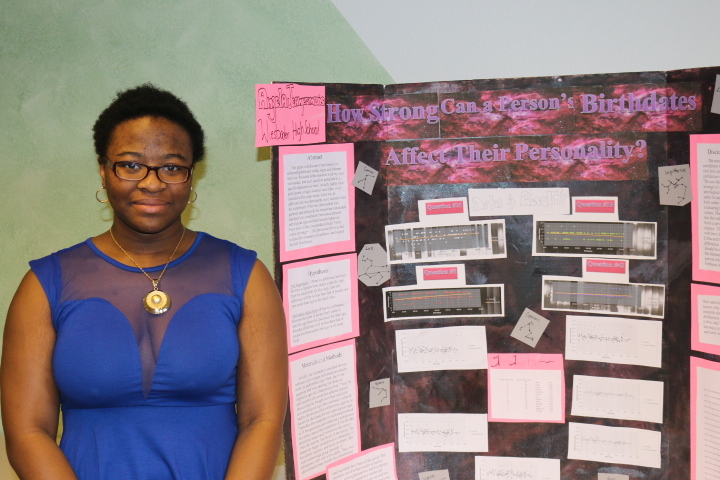 As the researcher observed the experiment, she recorded the data in a table of the different masses with their velocity, time, and number of pins received, kinetic energy, and potential energy. 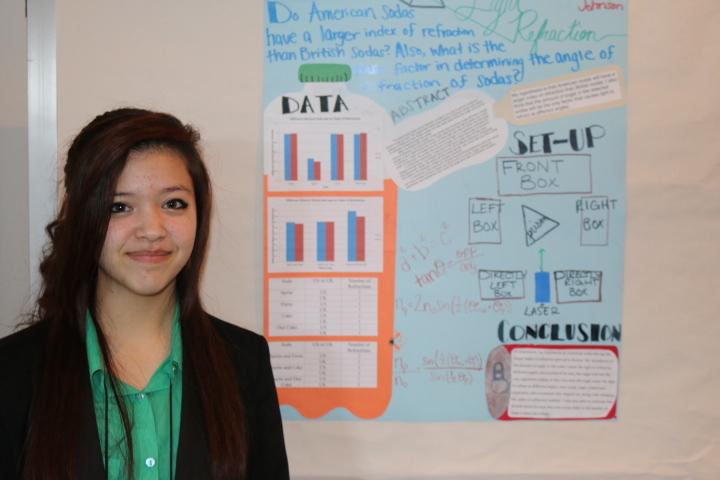 Using the tables, she made a line graph of the percentage of pins received based on the balls’ consistency. The researcher believed that the heavier balls, the more control they contain to receive more pins. 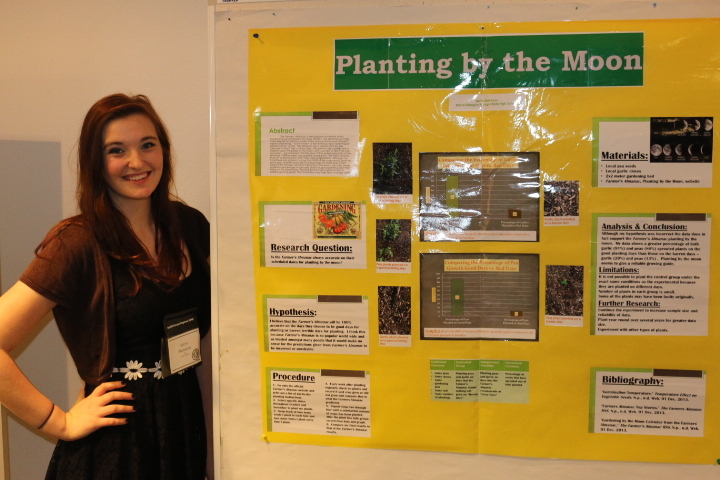 After observing the tables and the chart, the researcher realized that her project was a success because her hypothesis agreed with the data. The researcher noticed that most teenagers are subject to stress. Stress seems to be part of people’s daily life. Many adults suffer from stress. Stress seems to have a big impact on today’s society and on their health. 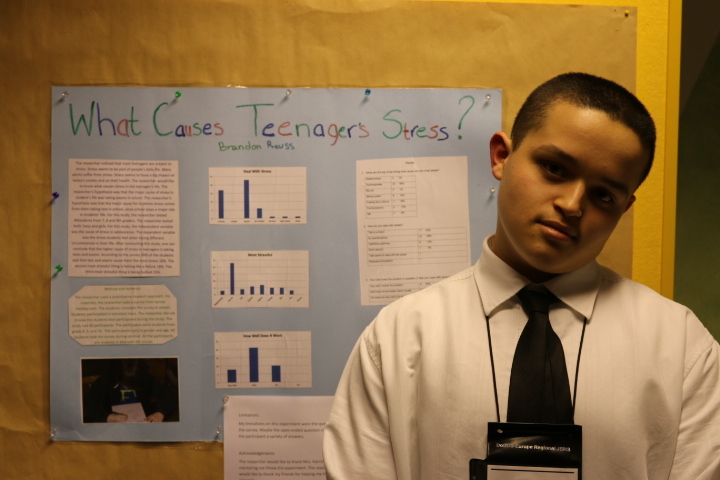 The researcher would like to know what causes stress in the teenager’s life. The researcher’s hypothesis was that the major cause of stress in student’s life was taking exams in school. The researcher’s hypothesis was that the major cause for students stress comes from them taking test in school, since school plays a major role in students’ life. 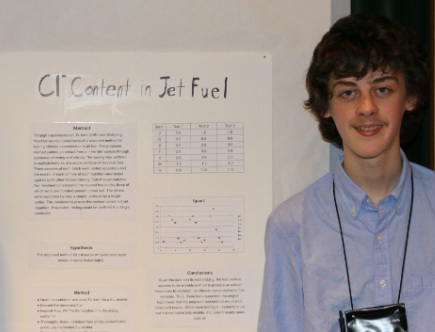 For this study, the researcher tested 40students from 7, 8 and 9th graders. The researcher tested both: boys and girls. For this study, the independent variable was the cause of stress in adolescence. The dependent variable was the stress students feel when facing different circumstances in their life. After conducting this study, one can conclude that the higher cause of stress in teenagers is taking tests and exams. According to the survey 58% of the students said that test and exams cause them the most stress 18%. The second most stressful thing is feeling like a failure 18%. The third most stressful thing is being bullied 15%. Essentially, the researcher wanted to look at the Physics of vehicle tires. The researcher wanted to focus on the tires' size and diameter, and their speed and performance up and down different incline angles. The main goal of finding the best tire is finding the biggest bang for your buck. The researcher performed an experiment that would show different tire performances. First, the researcher measured the dimensions of each set of Lego tires that would represent larger life sized tires. The researcher did the experiment by putting a mass on the middle of a constructed Lego car and first measuring how many Newtons it would take to pull the vehicle with the first set of tires on a flat inclined plane. The researcher would record the data found and performing this task three times adding up the three trials and averaging them together. The researcher will continue to do this with each set of tires and on a variety of different inclined planes. He made a table of the different tire dimensions with the amount of work each tire took to perform the task. The researcher also performed another test where he released the Lego vehicle at the top of the incline recording the amount of time it would take to reach the bottom. He made a table which recorded the velocities of each tire set. Using the tables, he made a line graph of the average amount of work each tire performed and their velocities. The researcher believed that the smaller the tire, the more work it would take for the Lego vehicle to move up different inclines. After observing the tables and the chart, the researcher realized that his project was a success even though his hypothetical statement was proven wrong by the statistical information. 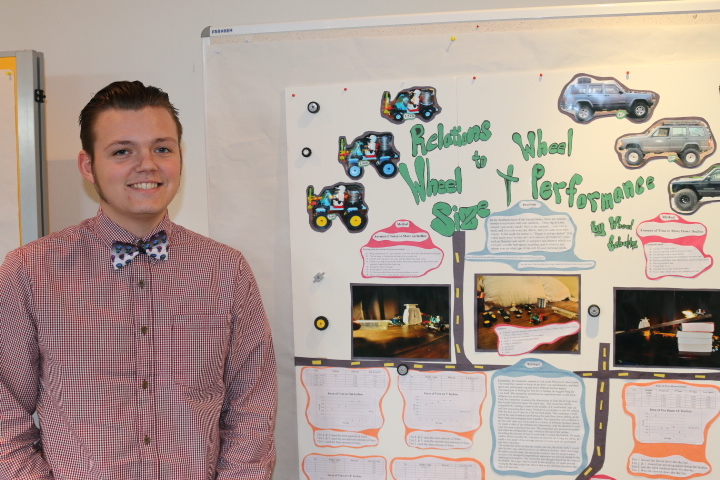 The researcher also thought that if the tire were to be smaller, the Lego vehicle would be the quickest, yet again proved wrong by the data which had shown that as the diameter increases, the time will decrease.